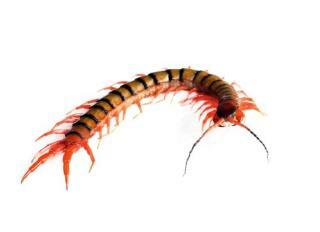 Who needs morphine when we've got centipedes? Centipede Venom Might Be Better Than Morphine: How would you feel if the ER doctor offered you centipede venom for the pain? The idea isn't so farfetched: A new study finds that the venom, which paralyzes prey, may also yield a compound that's more effective than morphine as a painkiller for humans. Cats Might Help Us Make HIV Vaccine: The quest for an HIV vaccine might get a boost from cats. Researchers studying the feline version of AIDS came across a tantalizing discovery: When they exposed a protein from the cat virus to the blood of HIV-positive humans, it triggered an immune response in the blood. That opens up new avenues of research. New Find on Moon of Saturn—Plastic: Earth and Saturn now have something in common: plastic. NASA's Cassini spacecraft detected the molecule propylene on Saturn's moon Titan, and propylene is one of the basic ingredients of modern plastic here on Earth. Lake Turns Animals Into 'Statues': We would strongly advise you not to go swimming in Tanzania's Lake Natron. Animals who are immersed in the water not only die, they're calcified and turned into creepy-looking "statues." High alkalinity is part of the reason. Scientists Solve 'Abominable Mystery' of Flowers: Turns out that flowers are a lot older than we thought. How old? Dinosaurs mights have been trampling them underfoot, a new study suggests.